In addition to the cinema online seat selection, we will come into contact with the aircraft cabin seat selection, of course, there's a bus ticket ticket seat selection. If there is one day to buy train tickets are also available online seat selection, then today I come to tell you how to use jQuery election under the seat plug-in to complete high-speed rail train seat layout, seat selection, different levels of seating pricing and other operations. And on an article like: jQuery online seat selection and reservations (theater piece), we use the same html structure, layout position shown on the left, the right side shows seat selection information. Please download the DEMO relevant CSS code source view, this article will not elaborate. The above code f represents the first-class seat, e represents the second seat, the symbol "_" represents the aisle. 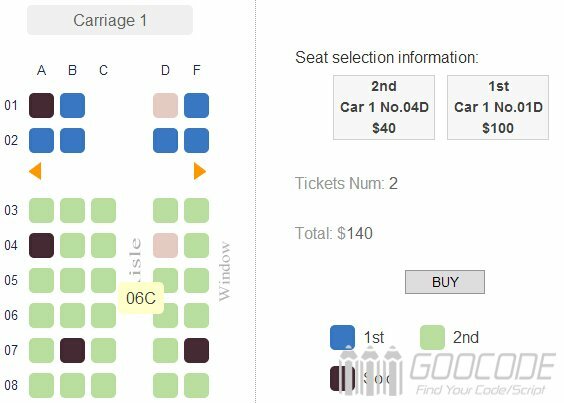 The above code defines a first-class seat and the second seat prices, the category name and the corresponding css styles. They can be called back by the method data (). Next we define the ranks of information by naming seating chart, as top is set to true then the top of the display indicates the horizontal (row), columns and rows are used to define the value of the horizontal (row) and the vertical axis (columns), getLabel used to return the seat information, such as: 01A represents 01 row A seat. Then we use the legend to define the legend, the legend associated with the corresponding element is #legend, and seat type definition corresponding style. Finally, outside the click (click) seating chart in position to make different treatment depending on the current state of the seat, including the calculation of the total amount of votes and so on, can refer to the description of the theater piece. Finally, we use the get () and status () method sets have been sold without the optional seat. Thanks for sharing another source. You can view the source code. It doesn't use any active page, so you can get it easily by viewing the source code. Hi is there a way to allow the name of the booked seat to be shown even in a tooltip and then have it go to database? How can i get the value of the seat that I have clicked and insert it to my database? I would like to try out the demo for this. I have seen a lot of people at the rush essay site talk positive stuff about this and I want to see if it really is as good as they so. I just have to finish my work first before I can try this.